First off, I want you all to know that I’m back in action. The 100th episode is currently being written, and you can expect it soon. In the mean time, I thought it would be interesting to look at some of the stats of Cosmic Quest, as of writing this post, so we can see exactly how far it’s come in 100 episodes. Many of these stats are all because of you, the readers, and to you I extend my thanks. I must say, I am especially proud of the number of new Pokémon. I think we can all agree we were disappointed when Kalos only came with 72 new Pokémon. The fact that I have now released more Pokémon than Kalos did, and I still have plenty more left unrevealed, justifies this project in many ways to me. When I started, I was uncertain I could make an entire region’s worth of Pokémon. Now I have surpassed the absolute minimum, and am on my way to making a fully satisfying number of Pokémon for a region. And once again, thank you so much. It’s been a pleasure writing the first 100 episodes, and I can’t wait to see where it goes from here. I’ve still got one more big surprise planned before the 100th episode, so keep an eye out for that! Sorry for the wait, but I suppose you’re probably use to that by now with all the breaks I’ve had to take. Speaking of, I first announced Nemex Unleashed way back on April 25. It wasn’t until October 30, half a year later that it actually was released, and now here we are, another three months later for the review. At this point, it’s nearly been a year since I first announced the movie. Trust me when I say I never meant for this to get so out of hand. I knew that I wasn’t going to be able to write much during the summer months, but when I first announced the movie, I figured it would be the final thing I published before summer. I planned to announce it in April, and then release it at the end of June, maybe early July if I had to. The problem was, as always, life got in the way. I was still in the middle of writing the Crater Cave/Den of Mega Evolution episodes, and I had to finish those before starting the movie, due to the tie-in at the end. And with how busy I got, I was unable to finish those episodes until mid-July. I started work on the movie right away, but with how busy I get during summer, I wasn’t able to work on it seriously until September, and at that point it still took me a month and a half to finish it. Anyways, as for the movie itself, I personally felt much happier with this one than I did the first. Not that I disliked Myoken The Guiding Light, I just thought that Nemex Unleashed had a much more entertaining and interesting story. I feel like it had a good balance of personal story, with the separation of Ash and Pikachu, and action/excitement in the Nemex vs. Heliosol battle. Originally, I envisioned this movie as simply being about the battle between the two Legendary Pokémon, but I knew I needed something to make it more personal. In my opinion, that’s been part of the issue with recent Pokémon movies in general. There hasn’t been much in the way of personal investment. This was on the top of my list of things I wanted to make sure I got right. The other thing I wanted to do right was the use of Team Rocket. It has been extremely rare for Jessie, James, and Meowth to directly interact with main cast over the course of the movies. While I understand the need to keep them off to the side in most movies, being the main characters that they are, I fully believe they deserve a major part, at least every once in a while. So making them the servants of Nemex was my way of making sure they were given the major role they deserved, and, if I do say so myself, it worked quite well. The final thought I would like to bring up is the fact that if it wasn’t already obvious back in Myoken The Guiding Light, Nemex Unleashed should now make it abundantly clear that my movies are all interconnected, this movie being a direct sequel to the previous. I was inspired to such from the first three Sinnoh movies. I was always impressed by the fact that the three movies formed a trilogy and built off of each other, and have always always thought that that was the height of the Pokémon movies. For the life of me, I cannot understand why, three generations later, they wouldn’t have tried it again (though, I suppose it looks like we might finally be getting it once more, based off of the trailer for the next movie). So I knew right away that I wanted to do the same with my movies, and more so. Of secondary note, I wanted to make a comment based off of Ultra Sun and Moon. Read no further if you don’t want any Ultra Sun and Moon spoilers. In case you didn’t know, Necrozma has already been made into a Light/Psychic-Type, and it’s signature move Prismatic Laser is a Light-Type move. It should be noted that Ultra Necrozma, in Luna, Terra, and Sol Versions, would be a Light/Dragon Combo-Type Pokémon, losing its Psychic-Type, while it’s new signature move, Photon Geyser, would also be a Light-Type. As a result, it’s signature Z-Move, Light that Burns the Sky, is also a Light-Type, making it the first Light-Type Z-Move, seeing as I have yet to make a generic Light-Type Z-Move, due to the lack of Z-Moves in my games. Also of note, is that when Necrozma changes into its Dawn Wings or Dusk Mane Forms, it loses its Light-Type, to be replaced by the Ghost and Steel-Types respectively, which is then regained when it transforms via Ultra Burst. Wow it’s been a long time since I’ve written these episodes. Let’s see how much I can remember to bring up here. Originally, these two episodes were planned to be only one, but they went on for so long, that I was forced to split them into two episodes. Even after the split, the second episode became the longest episode I had written up until that point. As I explained way back in the episode 80 review, these episodes were based off of an event in Luna, Terra, and Sol. Team Planetary’s attempt to take the Grand Meteoric shard and Showakusei forces the player and Cosmo down into a previously unknown chamber beneath the Crater Cave, the Den of Mega Evolution. Just like in these episodes, the player and Cosmo are forced to team up with each other and a mysterious Raichu in order to escape, both obtaining the ability to Mega Evolve in the process. Just as in the episode, the first chance to Mega Evolve comes when battling a non-Pokémon Entity called the Abomination, which can only be damaged by Pokémon that have Mega Evolved. Because you’re paired with Cosmo, it’s a double battle against the Abomination and a randomized Phantom Mega Pokémon. Of note with this entity, the episode took a liberty in relating it to Nemex. This was something I did purely for the sake to lead into the movie. There isn’t normally an explicit link between the two. This part of the game did not exist in my original concepts for Luna, Terra, and Sol, due to the fact that I made them before Mega Evolution existed. I liked how X and Y and Omega Ruby and Alpha Sapphire made your first battle with a Mega Evolution a special one, so I decided to take it to the next level and make it very special. Not only that, but I made sure you built up a bond with the first Pokémon you Mega Evolve before actually performing the Mega Evolution, by making it so the Raichu is the only Pokémon you can use until you escape the Den of Mega Evolution. After doing so, the Raichu will become the player’s permanently. I’ll get around to writing a review for the movie at some point. The past two days of Ultra Sun and Moon trailers have made me realize that I haven’t done anything yet to celebrate these upcoming games. Combine that with my recent reveal/focus on Sol Version, and it only seemed right to bring these two expanded versions together in one place. So without any further ado, I present to you the newest piece of bonus content, the Ultra Sun and Moon/Sol Version background. Two years ago today, on Cosmic Quest’s 1st Anniversary, I made Luna and Terra Versions that much closer to a reality by releasing their cover art. For the longest time now I have talked about Sol Version, the “third version” of my “generation,” but until now I have done little to make it exist. That ends now, on Cosmic Quest’s 3rd Anniversary. 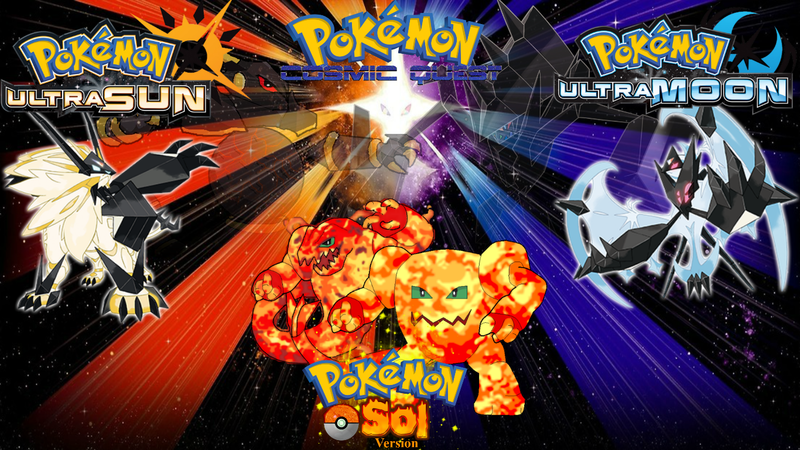 I proudly present the cover art of Pokémon Sol Version. There are three things to note from this artwork. Perhaps most obvious is that no longer are my games confined to the 3DS, they have switched over to the Nintendo Switch. But Sol Version isn’t the only game moving to the Switch. Luna and Terra have also both been officially moved as well. Look to the bottom of this post for their new cover art. The second thing you might notice is that the cover Pokémon bears a striking resemblance to Heliosol, and yet that’s not quite what it is. What could this Pokémon be? Is it perhaps some sort of alternate form of Heliosol? Only time will tell. Finally, you may notice that the logo on this cover is not the same Sol Version Logo I’ve been displaying. That is because I have redesigned all three of my games’ logos, making them much more unique, complex, and pretty. Take note that Luna and Terra also have new logos. In addition to this cover art, the site has gotten some upgrades to go with the “release” of Sol Version. A new page has been added to detail the Battle Final Frontier, Tenno’s version of the Battle Frontier. Also, the Tenno Region and New Features/Mechanics pages have been updated with Sol Version information, including a description of the return of the Pokémon World Tournament. Finally, as a special bonus, I have created yet another new page. This one is a gallery page, which features all of the various piece of art that I make for this website, but have nothing else to do with, and nowhere else to put them after they serve their purpose. Check it out. As promised, here are the new Luna and Terra Version covers. If you wish to compare them to the original 3DS versions, those images can now be found in the Gallery page. Thank you all for a great three years! And here’s to hoping the future will be even better! First off, I’d just like to apologize for the wait. First I had to deal with finals in school, and now I’m on summer break, which readers from last year may remember is a very inactive time for me as a writer. I will strive to write as much as possible this summer, but don’t expect more than an episode a month, possibly less. Sorry. Anyways, this episode honestly doesn’t have too much to talk about. It served to set up the coming episode more than anything else. Once again, this is a direct translation of an event from my game concepts. Just as Team Planetary captured Ryusei before, they have now moved onto the second Cosmic Guardian, Showakusei. However, the capture of Showakusei isn’t even the biggest event going on here. But to see what the bigger event is, you’ll just have wait until the next episode. One thing that is of note from the episode is Braydon’s reappearance. Despite his serious and competitive side, Braydon is also a bit of a conspiracy theorist and has a personal issue with Team Planetary. This side of him was shown briefly in the Chapter 2 of the Cosmic Chronicles, but this is the first showing of this side in Cosmic Quest.